Since the vast majority of American drum students aspire to play drum set or to play in the school band, it is with this track I will proceed. These guidelines may not apply to all aspiring drummers, such as those wishing to learn only hand drums or mallet percussion, for example, but it does apply to all students joining the school band as drummers. For an aspiring drummer wishing to learn drum set, the most common way to begin learning drums is by learning basic techniques on the snare drum. The basic techniques include grip, stroke, posture, reading music, counting, and dynamics. These techniques are later applied to drum set and allow the student to focus on the more difficult techniques of two- and four-way coordination, limb independence and interdependence, and polyrhythms without requiring concentration on the basic techniques since basic techniques are already well-known. Costs listed are for new equipment. Used equipment can be found for lower prices in music stores and newspapers, and online at eBay, Amazon, Craigslist, music stores, and classifieds. Buying used drum equipment is a great alternative and will save drummers (and parents) lots of money. The most essential item for practicing drums is a pair of drumsticks. 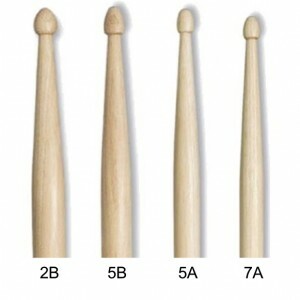 Drummers will come to prefer specific sizes and types of drumsticks as they gain experience. For a beginning student, these details are not important. Ask your drum teacher to tell you which drumsticks to get. The chart below shows what I tell my drum students. Drum Set 5B Good for general drum set. Drum Set 5A Good for smaller hands. Lighter than 5B. Drum Set 7A Good for smaller hands. Lighter than 5A. • Wood tip, not nylon tip. • Avoid colored or decorated drumsticks. They leave marks on drums and cymbals. • Save money by using factory seconds. Drumstick makers sell “defective” drumsticks. They work well. • Zildjian, Vic Firth, and Pro Mark are reliable. Ask your drum teacher about other drumstick brands. In addition to drumsticks, a practice pad is the minimum amount of equipment a drummer needs to practice introductory drum lessons. A practice pad is used as an alternative to a snare drum. Practice pads are much less expensive, but they approximate the feel of a snare drum. They are also much quieter than snare drums. Some practice pads can be mounted on a stand. Others are designed to be placed on a stable surface such as a stool, chair, table, counter, or lap. Some practice pads are designed to be placed on top of a snare drum. When placed on top of a snare drum, the practice pad acts as a muffler and also can provide grip and stroke muscle-building benefits. Note: Practicing on drum substitutes can cause damage. I’ve seen students ruin furniture, tables, dashboards, car seats, and, yes, even pots and pans. Instead of spending $15 on a drum practice pad, they have ruined expensive sofa cushions and dashboards. The money spent replacing those inappropriate drum substitutes could have purchased a nice snare drum. So if you need to save money by practicing on a drum substitute, consider the long-term value of the item(s) being used as a drum substitute. At a minimum, get a professional practice pad. While there are minimal disadvantages to learning drums on a practice pad, ambitious aspiring drummers may soon lose interest in learning without the experience of playing on real drums. Snare drum is the most common starting point for new drummers. A substitute for the snare drum, the practice pad, is described above. Snare drums designed for beginning drummers often come in a kit which includes a snare drum stand, a practice pad or silencer, and, sometimes, a bell set which can also be mounted on the snare stand. Used snare drums or snare kits can be found online on ebay and other sources. There is nothing wrong with getting a used snare drum in good condition. Buying used drums will save drummers a lot of money. I’ve found used snare drums for $30. Note that if purchasing a used snare drum with a broken drum head, replacement drum heads (sometimes called “skins”) cost at least $10 each. The standard snare drum size is 14″ (diameter). Some kits have a 13″ snare drum, which is just as good. The depth is not important, but most often ranges from 3″ – 6″. Sheboygan Drums rents snare drums and drum sets. Snare drums are also commonly available for rent through the student’s school or a local music store. Some rental programs have rent-to-own options. In the Sheboygan area, I recommend renting from Sheboygan Drums or Dreams Unlimited music. Monument Music, Sheboygan, WI Monument Music has been in Sheboygan for several years. Their website mentions instrument rental though I have no experience with their rental program. Eventually, every drum will require tuning or drum head replacement. The tool for this job is called a drum key. A drum key is used to adjust the tension of the drum head (the playing surface of the drum) by tightening or loosening the tension rods. Tension rods have a 4-sided bolt head. All drums use the same sized tension rods, except timpani. Timpani tension rods are larger and require a special drum key. Drum keys are often included with snare drum kits, and sometimes with drum sets and bass drum pedals. You don’t need a fancy drum key, but there are many styles available. If you do a Google search for drum keys, you will find many styles; designer drum keys, ratchet drum keys, necklace drum keys. The only type you need is the basic type shown here. I keep a drum key in every stick bag, and keep one handy in the drum teaching studio. I consider ear plugs essential when playing drums, cymbals, and other percussion. As a drummer, your ears will take a beating. Without appropriate hearing protection, drummers will likely acquire hearing loss and tinnitus. Tinnitus is constant ringing or other noises which result from damage to the hearing system. Tinnitus is not reversible – once you get it, you will always have it. Hearing damage and hearing loss is permanent. I provide detailed hearing protection information in How to Protect Your Hearing. Even with one pair of drum sticks, a stick bag makes a drummer’s life easier. Drummers who take private lessons will need to bring their drum sticks to lessons. Students who are in the school band may need to bring their sticks home to practice and may need to bring their sticks to off-site concerts. As a beginning drummer, get a small stick bag, like the one pictured here. For many drummers, this is all they will ever need. For drummers who go on to college, larger stick bags will be necessary to accommodate a variety of mallets, such as marimba mallets, xylophone mallets, timpani mallets, and cymbal mallets. A stick bag will last your whole career. I’ve had this one since the beginning. It has a few scrapes, but no rips, and the zipper works like new. I bring only the drumsticks I need for the concert I’m playing and leave the others at home. Note: When carrying mallets, keep them stored in their plastic bag to prevent fraying caused by worn drumsticks (most mallets come in a plastic bag when you purchase them). Keep a drum key in the outside pocket of the stick bag. I also keep ear plugs, a pencil, and a black felt cloth in my stick bag. Drummers often use music stands as trap tables to lay out mallets and accessories when quick changes are required. I keep the black felt for this purpose. A black towel also works, but felt is less bulky. The felt matches music stands, and keeps sticks from rolling and eliminates the noise when switching sticks. A bell kit is a small mallet instrument with metal bars and a mounting stand. Students in school band will need to be comfortable playing bells for band. Bell kits are available for purchase or rental, like snare drum kits. 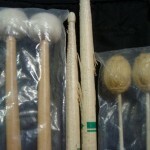 Having a bell kit allows drummers to practice mallet percussion techniques at home. Full-size mallet instruments are very expensive and are usually owned only by professional percussionists. The bell kit provides an affordable way for drummers to learn basic mallet percussion techniques. Drum students wishing to learn drum set will have achieved the necessary basic snare drum techniques in about 1 year. Drummers who practice liberally will be ready sooner. Drummers who practice insufficiently will not be ready as soon. Students who already have a drum set may begin sooner since they’ve already had the opportunity to gain some drum set experience. A standard 5-piece drum set is shown. Christmas time is a great time to find sales on new drum sets. Read my advice on drum set selection and drum sizes and talk to your drum teacher for advice about choosing a drum set. A standard set of cymbals includes a ride cymbal, a pair of hi-hat cymbals, and a crash cymbal. Some intro level drum sets include cymbals. The quality of such beginner cymbals varies from adequate to unusable. Read my article on cymbal selection or talk to your drum teacher for advice about choosing cymbals. A metronome is a device that produces a click at a steady tempo for musicians to reference the speed of music. Using a metronome while practicing helps train a drummer to play a steady beat. The ability to play a steady beat is a highly desirable skill for drummers to have. My metronome of choice for several years is the Korg MA-1. Most drum students will not own a mallet instrument other than the beginner bell kit they use early in their career. They practice on mallet instruments owned by their school or orchestra. Drummers who go on to study percussion in college may eventually purchase their own marimba, vibraphone, xylophone, or orchestra bells. These items are expensive and are typically available for use by percussion students throughout high school and college. It is difficult for drummers to maintain their mallet skills once they lose access to mallet instruments upon graduation from high school or college. Percussionist who become professional mallet players generally acquire their own instrument so they can practice and perform when needed. Mallet instruments can be damaged easily when transported frequently. Special models are made for touring drummers. As with mallet instruments, most drum students will not own timpani. It is even less common for percussionists to own timpani than it is for percussionists to own mallet instruments. Timpani are expensive and take up a lot of space. The most common sizes for a set of two are 29″ and 26″. The most common sizes for a set of four are 32″, 29″, 26″, 23″. While it is essential for drum students to practice on timpani to learn timpani techniques, a drum set can be substituted when practicing at home. Drum set tom-toms and snare drum can be arranged to represent timpani. A standard (five-piece) drum set has three toms and a snare, giving students four drums to use for practicing their timpani music. Since most timpani music will use four drums or fewer, this will serve the purpose for most timpani music. While using substitute drums does not allow drummers to practice tuning and stroke techniques, it does allow practice of rhythms, sticking, and dynamics, which are as essential to a successful performance as is timpani technique. Notice how spread apart the drum set toms and snare drum are. This is to approximate the distances between timpani. Practicing with the toms too close together will miss this important aspect of playing timpani. Moving from drum to drum requires a greater travel distance for each mallet which affects stickings and dynamics. Note: Timpani are arranged low to high (from left to right); Drum set toms are arranged high to low. See Use Drum Set to Practice Timpani for details about this substitution.